Junking is always up and down. Some weeks I can find a lot of things I like at a good price, and some weeks go by with no luck at all. Here are some noteworthy finds that will work out well for decorating my home. 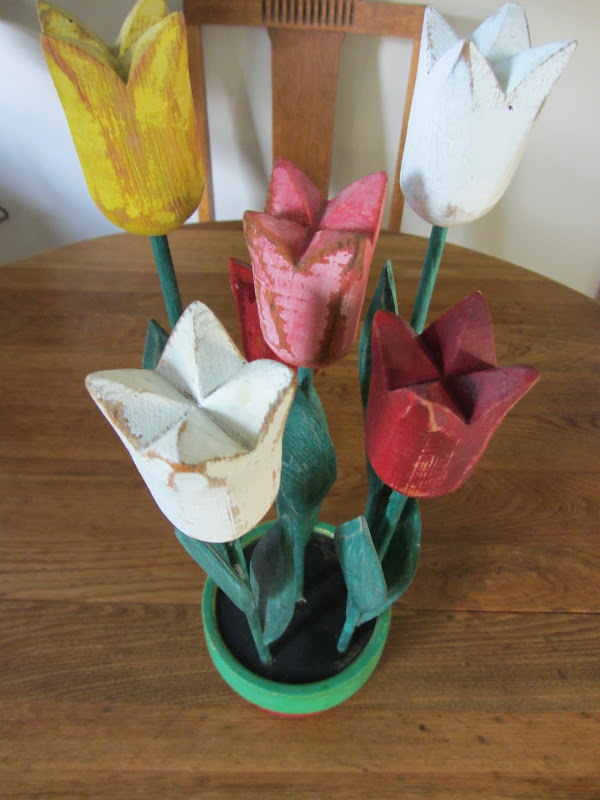 Vintage and distressed wooden tulips in an ugly green container for $2. The tulips are great, but I may have to either antique or paint the pot to tone down the green or simply set the container in a terra cotta pot. You will see them pop up in post soon. A great little white, distressed miniature metal oil lamp for $5. No chimney. I will have to find one to fit and it has to be very narrow at the bottom. Perfect for rustic vignettes. 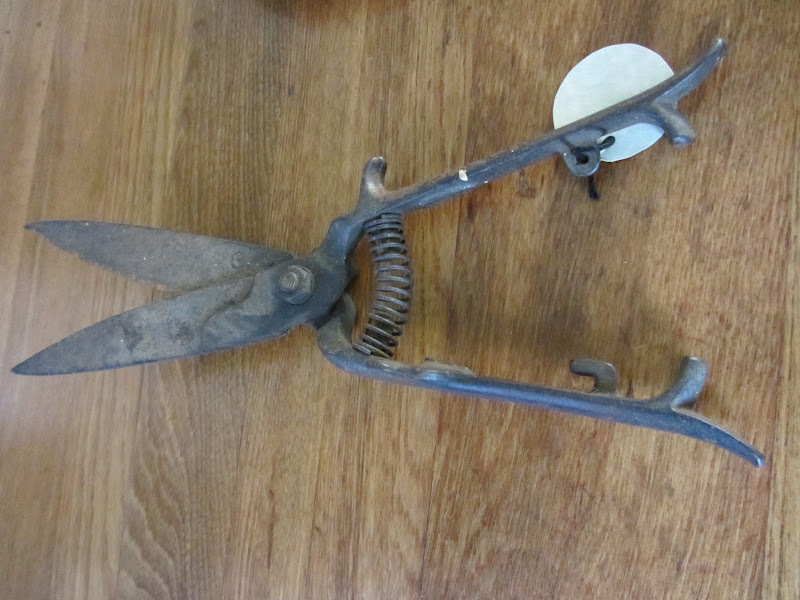 Vintage, rusty grass clippers for $6. They will fit right in with my garden tool collection. I think this is an egg tray. Unmarked. 12 indentations but most deviled egg trays have the egg laying lengthwise instead of up and down. 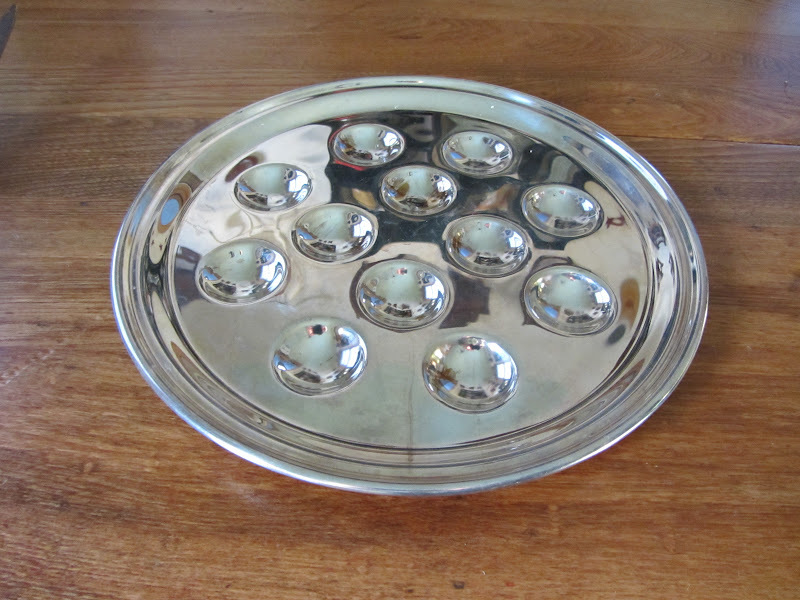 It might be silverplate or very shiny stainless. I could picture it with decorated Easter eggs on it. $2. Then two lady figurines to add to my collection. Florence Ceramics Sue Ellen and Delia. No damage. $4 each. 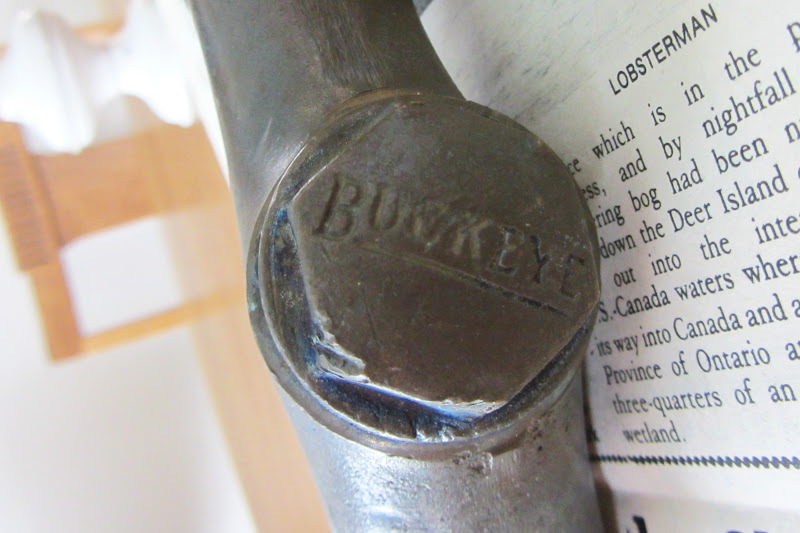 Then my most unusual find, a Buckeye gas nozzle. I think it's brass. I paid $6. This will probably go in my junk flower garden unless I find out it has some value for resale. So would you have picked up my thrifty finds too? 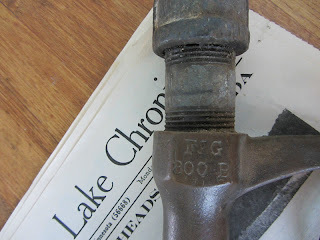 I think those old gas nozzles are so interesting and would look extra awesome in the garden. I am a new follower, and I just love your blog and decorating style. I am a Halloween artist and I have taken a break from my art to raise my granddaughter, and I think I will start working on decorating my home. Great finds. That BUckeye gas nozzle may go for some money in Ohio. I swear some of the people here would buy anything with "Bukeye" on it. And for the egg holder. Have you seen the deviled eggs that look like little chickens hatching. They stand up, with the top on them. Part of the egg is showing with a face on them. Someting for eyes and a little beak. This container would be perfect for those. I want to make some, they are so cute. Great idea for the gas nozzel...in the garden! How clever! My creative juices are flowing! The Greeley Girls! Vsiting from Time Travel Thursday. 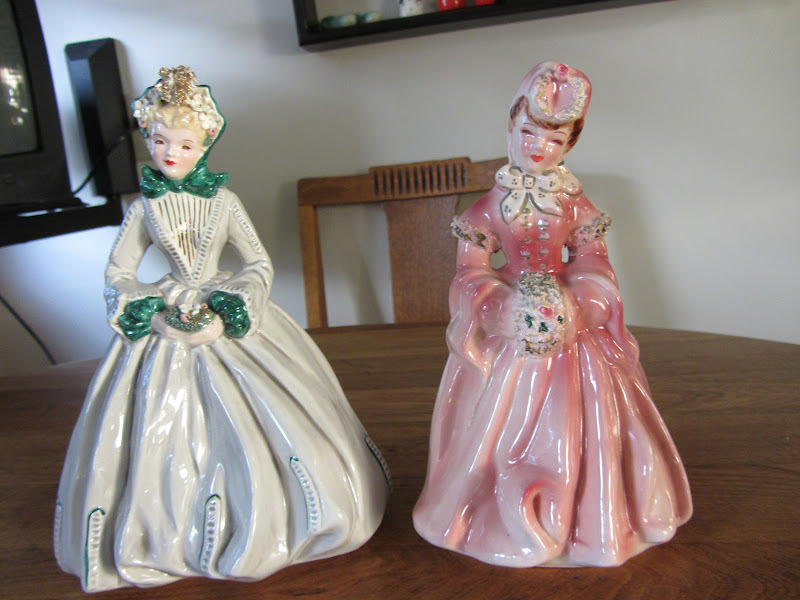 Love all your vintage finds, especially the Florence figurines. Fantastic that you got them for only $4.00 each! Great finds at the TS. Your tulips are wonderful and I would have brought those home too, and just like you either painted the pot or find one at home not being used. Your gas nozzel is a great idea for the garden. My favorite find, your lovely lady figurines. What fun you'll have finding the perfect vignette for them. I'm so happy to meet you…….. 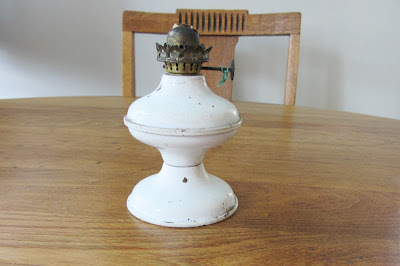 Thank you for sharing your terrific new finds at Potpourri Friday! 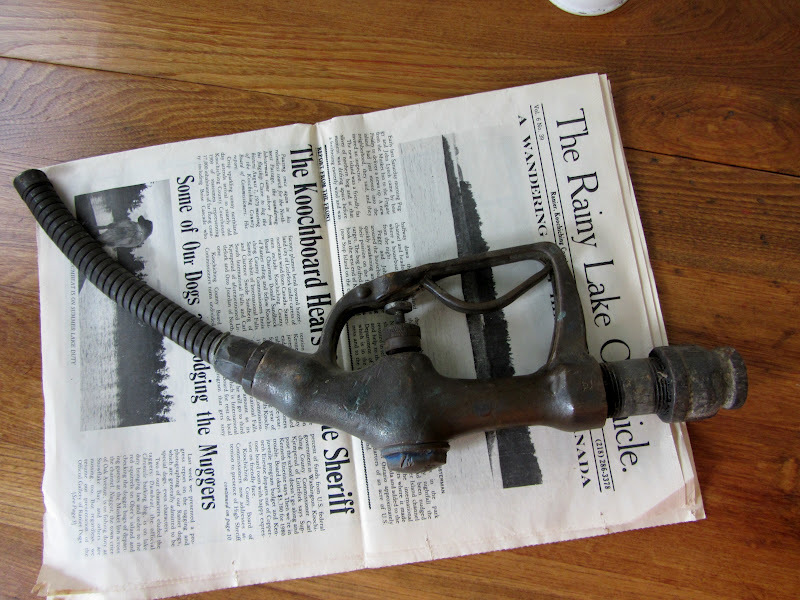 Oh I love your ladies..what a great find..
Cant wait to see what you do with the gas nozzle..
Wow, you found great ones this week! Thanks for visiting with me too! Well I think these are all fun finds! 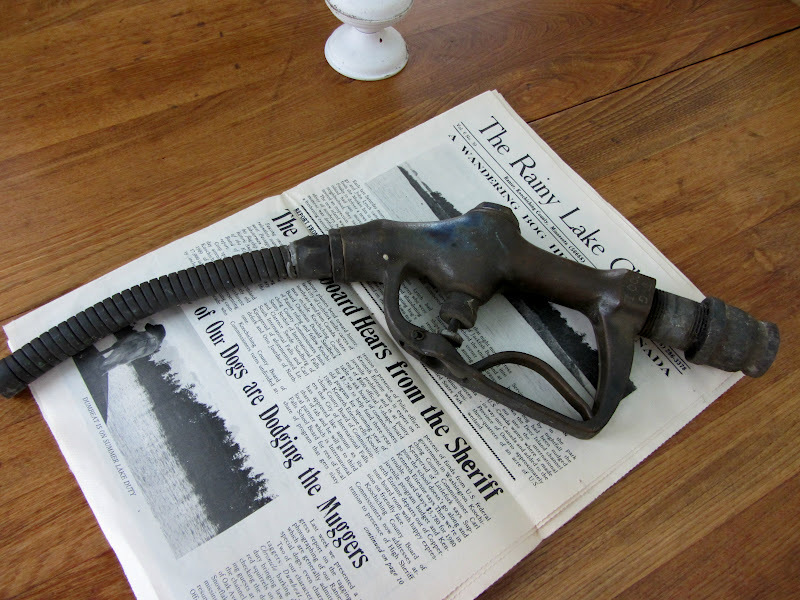 I love the gas nozzle and think it will be awesome in your garden! I think unusal things like that are just so fun to find in unexpected places. Thank you for joing ttf this week and I hope you have an awesome weekend! That old gas novel would look so cute in a garden (wish I had one)! 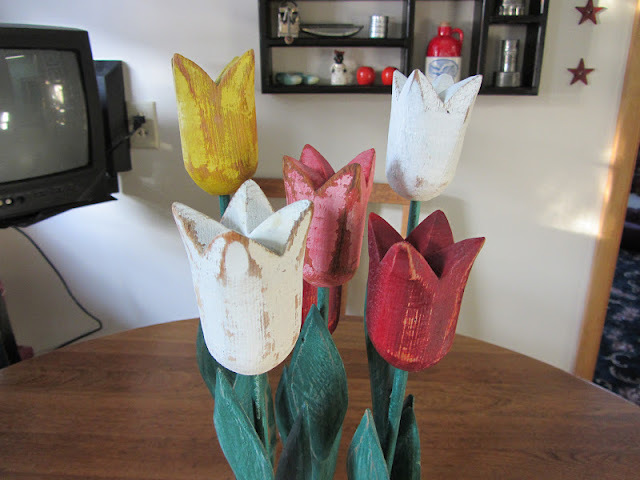 Love the wooden tulips too! 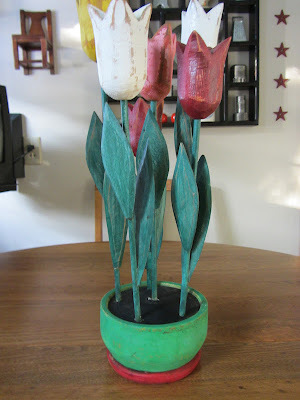 Hey those are my tulips I had back in the day...lol Mine weren't in an ugly green pot tho! LOVE, LOVE , LOVE those little ladies!! I just found your blog a week ago and am enjoying all the nostalgic feelings it is bring to me. I have many loves (not to mention collections) similar to yours (tins, galvanized anything,thermos' and on and on) and you have inspired me to use them in new ways. Thank you for sharing all of your wonderful ideas. When I viewed this post, your egg tray reminded me of some escargot plates that I have. They are exactly the same size and shape. Just thought it was worth mentioning.